Oh Michelle what fantastic pieces you[ve bought. I love the whistles top and the dress, well all of it but I have been thinking a lot about those slip on's lately, a post has been drafted lol.I had my eye on a John Lewis Mac in that shape about a year ago and ended up getting the Gap one because it sold out, I've never forgiven myself for missing out as it would be the perfect shape for me. Hair still looking good girl! The slip ons are so comfy Sharron....I would definitely go for them!! They've surprised me, more so in the black because they are inbetween a trainer and shoe if that makes sense! I love them! Tis a great trench isn't it! Very fuss free without a belt!! Hi Michelle!! Well done you, you have sales shopping down to a fine art and each item here is just super stylish and well worth the money spent!! The Jaeger dress looks gorgeous on you and I'm sure will be a firm favourite, as will the cute Whistles top and the Gap sweater was a fantastic find!! Loving your daily outfits too, always so casual chic and the Next sneakers look fab on too, very stylish and versatile! Hey my lovely! It most certainly helped to have a kind of plan! Just like you I had an idea that I just wanted to bag a few classics and I managed not to deviate!! Yay! Can't believe how cheap you got the Gap jumper for...that's such a good deal!! Love the mac too, so timeless. Spookily I have the exact same Whistles top, I bought it in the Sale last year & even then it wasn't £20 so you got a great deal!! Love the black dress....gorgeous! Looks fab with the leopard heels. I always seem to get lucky when I get myself down to Clark's Village Sian! Have managed to get some really great bits in Whistles and I find that the Gap outlet is always good for basics!! I love Jaeger for shirts and sweaters for the DH too! Bargain Hunter should be your middle (two) names! LOVE the white Whistles top - love love love it! Very well done, you found some great bargains, Michelle! My favourite is definitely the black dress, it's gorgeous! Also love the white top. I bought a white lace jacket in the sale but will probably not wear it before spring. Didn't I get lucky with the merino sweater Donna....I saw them too yesterday, not much of a reduction was it! You jammy girl! 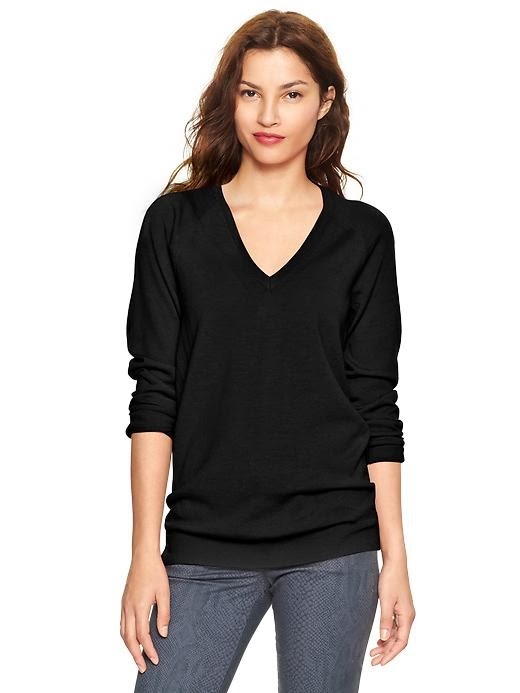 What a steal for the merino jumper from Gap! And I love the Whistles top - I saw it last year and they sold out by the time I decided it was cheap enough for me to indulge in yet another pretty white top. And I did notice you'd picked up the black pony skin ones as well. They are really comfy aren't they? And an absolute steal. Might have to go back for those but I think I would be shot for buying another pair of shoes. I have rather overindulged in footwear in the last few months - I didn't even know I had a problem until I pulled out all my shoes and thought - ooh they're new, and those and those!! Arghgh. I had a real inkling that it had been priced incorrectly when I went in the fitting room with it Sue since I had paid full price for a grey one the week before!! So when I went to the till I had everything crossed in hope that I could get it for the reduced price.....I love it all the more for it being such a great deal in the end.....£7.99 for a merino sweater! Whoop whoop! U nabbed some great bargains, I'm so jealous haven't bought any clothes in weeks now! Your blog always reminds me that I need more jumpers, so I'm going to concentrate on those for a while.